Introducing Didriks Holiday Gift Sets At Didriks you will find fabulous gift ideas to help make this season's gift giving a cinch, from our beautiful selection of dinnerware and stemware to our new Didriks gift sets, with something appropriate for almost everybody on your list.Happy Holidays to All! The latest posts of our Dinner Series blog feature a subtle "snow and ice" themed setting spotlighting Finnish and Swedish designed tableware, accented with dramatic red from local New England cranberries. Shown above: iittala Piano Workshop flatware, Kosta Boda Limelight plate and iittala Ultima Thule highball glass atop a Chilewich Lattice placemat in white. Also shown: the iittala Kivi votive in clear. 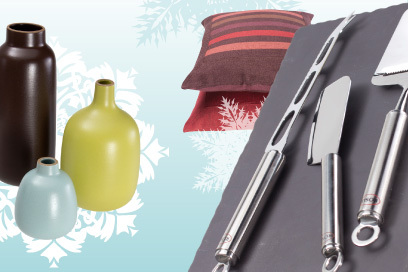 Visit the Didriks blog to find our staff favorites from our gift sets. The Linens by Didriks blog recently spotlighted the Dieppe Kitchen towel by Libeco Home, which InStyle Magazine put in their "Perfect Gift Bag". We certainly agree. At Didriks you will find an outstanding selection of outdoor furniture, tableware, linens, and cookware to create your perfect living environment. Visit our store or shop online. Jars Ceramics Vases Distinctive glazes and hand-made quality give these vases a charming personality. Lafco CandlesThese subtle scented candles make wonderful gifts for every room in the home. Didriks Gift CardsDidriks gift cards make the perfect last minute gift. They are available in-store or online.